This little book, conceived and edited by my longtime friend and collaborator Joan Konner will surprise you with absolutely Nothing. Read it—and Nothing happens. Nothing is the joy of it. Now here, for those friends and family members who go “Bah! Humbug!” at the mention of Christmas, is a very alternative gift. This is just the present for those who feel they should celebrate nothing during the festive season. Joan Konner conceived and edited “The Atheist’s Bible,” which became a national bestseller in 2007, and she produced the PBS documentary “The Mystery of Love.” She is Dean Emerita and Professor Emerita of the Columbia Graduate School of Journalism, as well as the former publisher and currently an honorary co-chair of the “Columbia Journalism Review.” This is her second book and it is brimming with a juicy and wide-ranging smorgasbord of quotations from artists, mystics, musicians, poets, philosophers, playwrights, scientists, and comedians. The other day I received a note from a fellow Zen practitioner. For the tag line he used one of those jokes floating around the web. As I read it I felt a flash of guilt. I recalled being contacted with an offer of a copy of a book to review. Actually the book has been sitting on my bedside for a while, and as it is essentially a compilation of quotes, I’ve enjoyed dipping into it most nights of most weeks. But the review just never quite happened. Well, here it is early Christmas morning. I’m sitting in the family room, the family not yet up, my laptop on my lap, a cup of coffee by my side, and I’m looking at the book. Journalist Joan Konner conceived of it and edited it. It is a delightful conceit. A compilation of non-Buddhist bon mots, sayings, anecdotes, passing thoughts, all touching upon nothing. It’s the end of daylight savings time on the east coast, and it just about always seems to be dim. Each day is largely dark, and cold, hinting at the uselessness of endeavor and the insubstantiality of what we ordinarily run around seeking. It’s a good time to be depressed. Just a few months ago, the space station orbiting the earth reported three near misses with junk in space. What is, and should be, a stunning advance of modern technology, a man-made satellite in search of new knowledge, is repeatedly being threatened with damage and possibly, destruction by a blind spot in our material conception of life. That blind spot is Nothing, a necessary and essential component, of our everyday lives. Nothing exists. Nothing is an essential presence in our lives. Paradoxical? Yes. Illogical and irrational? Yes. Yet to ignore Nothing is to deny our road to renewal. Just look at the world around us: wars, weapons of mass destruction, pollution, the leftover junk of the backend of doing, with the planet spinning ever closer to self-destruction, even as it increases its access to knowledge to solve those problems. Yet we deny that paradox exists. We deny the irrational exists, although mounting evidence for both is reported daily in the media in the events and behavior of our times, including by the media. We of the Age of Reason the scientific method, of technology that works, yet we violate the very core of creation, the “‘Nothing’ that Renovates the world,” as Emily Dickinson wrote. The evidence for symmetry and paradox, equal and opposite, is present in Nature and human nature. Nature intends its unintended consequences. Duality is Oneness, as represented in the symbol of the Tao. Nothing is. Nothing exists. Although Nature abhors a vacuum, Nature would have nowhere to rush in to fill it, if a vacuum didn’t exist. Where would something happen? Stars disappearing. Novas appearing. Leaves falling. New leaves growing. One generation dying, another being born. That vacuum, that Nothing, is with us all the time, everywhere, rushing in and out of existence in an instant. Nothing is the still center of the wheel of life. In the dark evanescence between equal and opposite, the Universe ignites. Eastern sages have accepted the existence of Nothing for millennia. In Nothing—aka Emptiness, Nirvana, and Bliss—Eastern traditions have found a wellspring of culture, harmony, and wisdom. Deep thinkers in the West—philosophers, poets, artists, scientists, mathematicians, playwrights, musicians—have also written about Nothing for millennia, some with fascination, many with dread. Years ago Einstein observed: “If I allow things to vanish according to Newton, the Galilean inertial space remains; following my interpretation, however, nothing remains.” (See Ch. Science Sutra, P 147.) Heedless, Western materialist culture, caught in a vise of logic and reason, has ignored the presence of Nothing in our everyday lives. Like Sorcerer’s Apprentices toiling and boiling over, our days are drowned in doing and the inescapable consequences of so doing, weighted by waste and lacking renewal. “You Don’t Have to Be a Buddhist to Know Nothing” is sound-bite journalism. The book takes a playful approach to a difficult, profound, even absurd, idea. It is a verbal collage to intrigue, tickle and tease the mind and to preserve insights for a culture too densely packed with timely distractions. Each quote becomes a timeless meditation. Why does Nothing matter? If where, when, and from whom we are born are Destiny, then Nothing is our Free Will. Nothing is the locus of individual choice and possibility. If we deny our Nothing, we shrink our possibilities like a dying ocean. We deny ourselves the silence and the clearing which hold the seeds of creation. What we make of our Nothing is what we make of our life. We were glad to see old friends on these pages from various artistic arenas including Samuel Beckett, Edward Albee, and Harold Pinter from theater; Andy Warhol, Wassily Kandinsky, Paul Klee, and Ad Reinhart from the art world; W. H. Auden, Charles Baudelaire, Emily Dickinson, T. S. Eliot, and Allen Ginsberg from the realm of poetry; Bob Dylan, Woody Guthrie, Randy Newman, and John Lennon from pop and folk music; Abraham Joshua Heschel, David Cooper, John of the Cross, Meister Eckhart, and Eckhart Tolle from the world of spirituality. Konner reflects about the reasons for this book briefly in her foreword. It’s an interesting piece that shows some insight into the spirituality of emptiness. She asserts, and for me critically, how her book shows, “if nothing else, that Nothing capital N, exists simultaneously with Everything, capital E.” I consider this insight the foundation of my own life. And it can be the gate to liberation for all of us. Really a small quibble. And not at all meant to discourage someone from getting this book. The introduction is actually quite intriguing. It suggests a spiritual insight from a non-spiritual person. Which I find delightful. And important. It has long been my thesis that if the great insights of the Zen way, particularly how we are at once unique creatures precious beyond description and that each of us is at bottom boundless, open, empty, nothing – then that insight should be stumbled upon by people outside the Buddhist world. 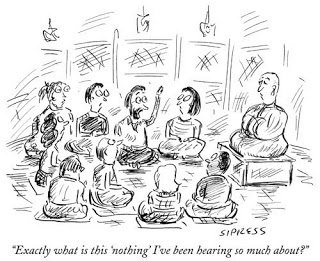 This is the way we conventionally view what Buddhists call emptiness, and mystics of many traditions call nothingness or the Void. A really murky day, pointing to the uselessness of it all. But at the heart of personal, transformative wisdom, this emptiness isn’t a cold, depressing problem, leading us down to nihilism—seeing emptiness is liberation. It brings us right through the seeming solidity and oppressiveness of our ordinary concerns, into a world where reality is shimmering, translucent, vital, while also being insubstantial, fleeting, and evanescent. In our human lives, experiencing this kind of profound emptiness means that like a candle flame gets blown out, our separateness and suffering are blown out. Not our capacity for love, or kindness, or clear seeing, or relationships, or work, or choosing soy ice cream in the grocery store over the dairy kind. I first met Joan when she was working on the “Mystery of Love,” a PBS documentary. From love to nothingness, in a few short years. That makes sense to me. In Buddhism we would say that when we perceive the transparency, the insubstantiality of life, we grow in wisdom. When we perceive relatedness within life, the interconnectedness, we grow in love. One never excludes the other. In her book Joan has put together a collection of quotes from writers, philosophers, artists, musicians, poets, mystics and folks like the rest of us, all about, well, nothing. It is so much fun, along with being provocative and illuminating, to read. Everything is there, from Paul Valéry, “God made everything out of nothing, but the nothingness shows through,” to Emily Dickinson, “‘Nothing’ is the force that renovates the World,” to Oscar Wilde, “I love talking about nothing. It is the only thing I know anything about.” Almost every page invited me to take a few risks in perception, and step out of the strictures of feeling this day to day reality as all too solid. In our society we are taught to badly want this and want that. But no matter what we get, it is never enough because it doesn’t last. So the search for new experiences goes on and on. We look for new intellectual experiences and sexual experiences and cosmic experiences. Over and over. We even see people willing to destroy their bodies, their minds and their loving relationships—destroy their lives—for a new experience. Even if a pleasant experience could endure, we could not bear for it to go on and on. Who could watch the same movie over and over without wanting a break? Who could listen to a sweet sound that never stops? Yet commonly when we seek rest from one experience we do so, ironically, by seeking another. It is possible to find rest even from the constant tedium and pressure of changing experience through knowing the difference between bleakness and what is meant in Buddhism by emptiness. May the consideration of nothing free you from anxiety, dread, and all unhappy things. It’s right here. Joan is one of our most respected journalists—as Dean Emerita of the Columbia Journalism School and a longtime producer of Bill Moyers documentaries. Right now, like all journalists, she is standing at the end of a sidewalk, watching her beloved profession crumbling in front of her—and hoping that creative new forms materialize ahead. She’s also interested in the voids beyond what our language and our religious faiths can express. She wants more people to become aware of the vast body of reflections on “Nothing.” And at the same time, she has created a book about this Nothing in a new-style format that she calls a “sound-byte library.” She’s standing at the end of the sidewalk of 20th Century journalism—casting her new style of book into the undefined nothingness of this 21st Century. People may imagine their own beliefs into this point and that might take the form of a literal God or it might take the form of George Lucas’s Force. You can imagine into that zero point, but basically we don’t know. Our words don’t work there. Has some text tried to capture it? Yes, I think this is what my book is trying to do.